Your Love Story Begins Here! Located in heart of Gatlinburg TN Smoky Mountains is this romantic and secluded log cabin. It is a gorgeous romantic cabin perfect for your honeymoon, romantic weekend getaway. This cabin is not for families. Love Story cabin is located in the City of Gatlinburg, just minutes to downtown Gatlinburg, Pigeon Forge, Ober Gatlinburg Ski Lodge, Dollywood, live dinner shows, all the attractions, shopping and great restaurants. The cabin is very secluded and private, withs lots of trees that surround the property. It also has a wonderful mountain view, private deck with large hot tub, pool table, wood burning fireplace, big screen TV, unique Bubbler Jukebox, fully furnished kitchen and very romantic open loft master bedroom with king bed. Best of all it has a red heart shaped Jacuzzi that sits under a skylight and when you look up, you can see the stars and moon on a clear night. Love Story Gatlinburg honeymoon cabin is privately owned and operated. It is bautifully decorated, with romance in mind, and will be cleaned to perfection awaiting your arrival! You can e-mail me, the owner. Ask to rent Love Story! This cabin is for couples, wanting to get away for a romantic weekend or honeymoon, not for family vacations and no pets of any kind are allowed. 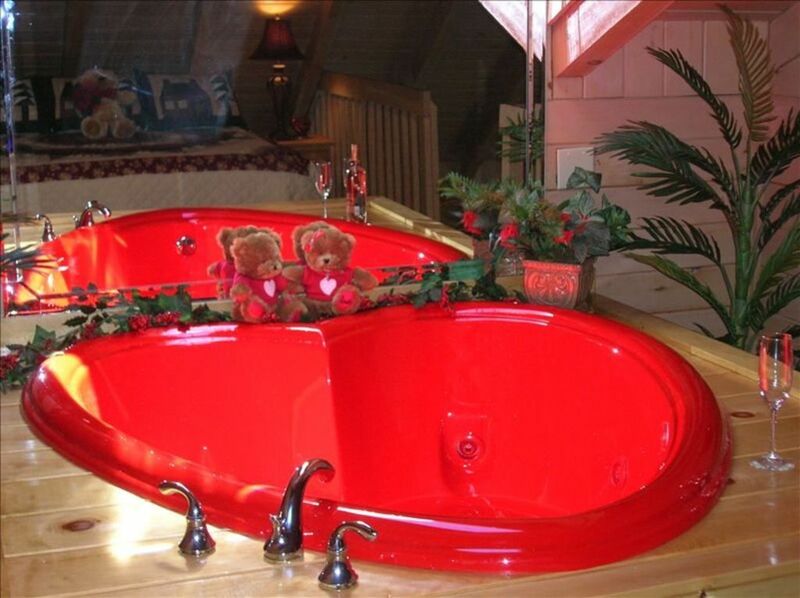 Love Story has a Hot Tub, Heart Shaped Jacuzzi, Mountain View, Secluded Location. My husband and I enjoyed our stay in this cabin. Everything was absolutely perfect here celebrating our 10th wedding anniversary! The place was very clean and supplied with everything we needed to enjoy the time away. We were close to downtown Gatlinburg but also far enough away to enjoy the nature. We definitely will be coming back to this location! My husband and I had a great time! This cabin was perfect for the two of us as we cerebrated our 40th wedding anniversary. I'm happy that we chose this place, it was very clean, and cozy! This is a very nice cabin for two. My wife and I enjoyed the cozy feel and quiet setting. The cabin is well maintained and clean. Janice was very easy to work with. The location was ideal - remote enough to be quiet but close enough to be in town in a few minutes. I highly recommend this cabin! My husband and I had a wonderful time, cabin is secluded and quiet. Perfect romantic getaway. We had a wonderful time, the cabin was just perfect! Love Story is close to downtown Gatlinburg, Smoky Mountains, Aquarium, Dollywood, Ober Gatlinburg Ski Lodge, shopping, wonderful restaurants, and many Smoky Mountain Wedding Chapels! Close to major Trolley stop where you can park and ride to any destination for fifty cents one way. Trolleys run every twenty minutes. Close to grocery store. If this cabin is booked, check out Hanky Panky at vacationrentals listing #53440. THIS CABIN IS NOT PET FRIENDLY, AND DOES NOT ALLOW SMOKING INSIDE. I RENT TO PEOPLE THAT HAVE ALLERGIES AND THEY DESERVE A NICE CLEAN CABIN ALSO. IF DOING EITHER OF THESE PLEASE DO NOT RENT MY CABIN. 20.00 EXTRA FOR EACH GUEST OVER TWO PERSONS A DAY. IF YOU STAY IN THIS CABIN YOU ARE EXPECTED TO PAY FOR THAT STAY. TWO WEEK CANCELATION POLICY.